The collection of cycles on display at Drumlanrig Castle when we took the photographs for this feature was in private ownership, and has since been moved elsewhere. The Scottish Cycle Museum show in this feature therefore no longer exists. We have kept this page as originally written simply to show what the museum used to be like. The story of Drumlanrig Castle and its close links with the Douglas family is set out in our feature page about it. There is also a separate feature page about Drumlanrig Castle Gardens. 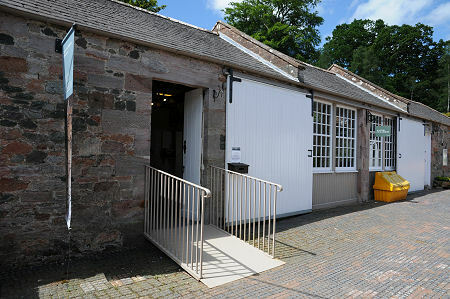 On this page we focus on the Scottish Cycle Museum, located in the stable yard behind Drumlanrig Castle. Full information about opening hours and admission prices can be found on our Drumlanrig Castle feature page. Drumlanrig Castle's links with cycling are strong. It is arguable that the ancestor of the modern bicycle was invented by Kirkpatrick Macmillan, a blacksmith from nearby Thornhill who often worked at the castle. Some time in the late 1820s, Macmillan saw someone riding a velocipede, a bicycle that was propelled by the rider's feet pushing backwards on the ground, and decided to build one for himself. Having done so, he realised that there was scope for significant improvement. In 1839 he completed his improved bicycle. Made of wood, it had iron-rimmed wooden wheels, a steerable front wheel, and a rear wheel that was connected by a series rods to pedals, which the rider pushed alternately forwards in an horizontal reciprocating movement. Before long, Macmillan was regularly to be seen riding the 15 miles between his home and Dumfries. In June 1842, Macmillan seems to have ridden the 70-odd miles to Glasgow. A newspaper report talks of "a gentleman from Dumfries-shire bestride a velocipede of ingenious design" who knocked over a little girl in the Gorbals area and was fined five shillings. Many believe this was Macmillan, though others question whether a newspaper would describe a blacksmith as "a gentleman". Macmillan did not patent his invention, and in 1846 Gavin Dalzell of Lesmahagow produced a very similar machine, leading to a belief that persisted through much of the 1800s that he had invented the modern bicycle. For anyone who has ever ridden a bicycle - which means most of us - the Scottish Cycle Museum is a real gem, and well worth seeking out during your visit to Drumlanrig Castle. It occupies two large rooms in what look like old workshops in the stable yard. The first of these has in pride of place a replica of one of Kirkpatrick Macmillan's bicycles, constructed in 1990. Elsewhere in this room is a racing cycle on a section of a velodrome, and amongst the other exhibits are two that will bring back memories for many, a Raleigh small wheeled bike, and a "Chopper", a bike whose desirability for young boys in, if we remember correctly, the late 1960s, was out of all proportion to its effectiveness as a means of transport. 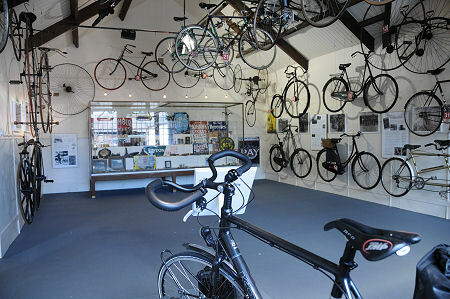 The wide range and the large number of cycles on display is one reason why the Scottish Cycle Museum is so good. A second is the quality of the information on show, with panels placed at frequent intervals around the walls highlighting exhibits of particular interest, or topics such as the emergence of the bicycle, and the role of bicycles for leisure, in war, and in sport. The larger, second, room, has bikes on every wall and in the rafters. Highlights include a tandem with a child-sized sidecar, and the bicycle used by Mark Beaumont to cycle 18,000 miles around the world in 2008. There is also something that looks like a reversed penny farthing, with the small wheel at the front and the large wheel at the rear. A large exhibition at one end of the room will spark many memories with its displays of puncture repair outfits, toolkits, bike lamps, and many other items that featured large in the lives of cyclists in years gone by and today. Located within the grounds of Drumlanrig Castle. See our Drumlanrig Castle feature page for full visitor information. Remember Wanting One of These?